Obesity rates have reached epidemic levels with over 300 million obese individuals worldwide. Laparoscopic sleeve gastrectomy (LSG) as a primarily restrictive bariatric surgical procedure has been shown to be effective in producing marked weight loss. However, LSG associated gastric leakage and hemorrhage remain the most important challenges postoperatively. Staple line buttress reinforcement has been suggested to reduce these postoperative complications. 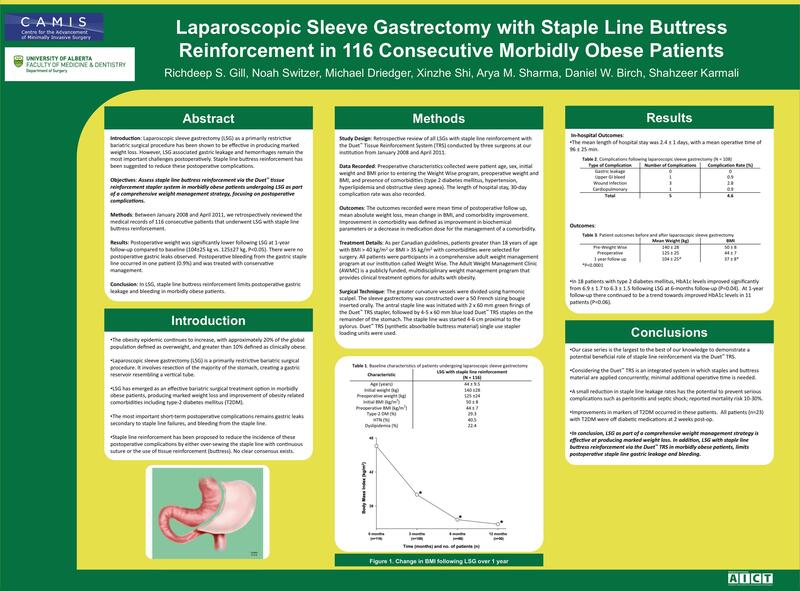 Our objective was to assess staple line buttress reinforcement via the Duet™ tissue reinforcement stapler system in morbidly obese patients undergoing LSG as part of a comprehensive weight management strategy, focusing on postoperative complications. Between January 2008 and April 2011, we retrospectively reviewed the medical records of 116 consecutive patients that underwent LSG with staple line buttress reinforcement through the Weight Wise Program. The mean age of patients was 44.3±9.5 years, with mean preoperative BMI of 44±7 kg/m2. The mean operative time to perform LSG was 96±25 min. Postoperative weight was significantly lower following LSG at 1-year follow-up compared to baseline (104±25 kg vs. 125±27 kg, P<0.05). There were no postoperative gastric leaks observed. Postoperative bleeding from the gastric staple line occurred in one patient (0.9%) and was treated with conservative management. In LSG, staple line buttress reinforcement limits postoperative gastric leakage and bleeding in morbidly obese patients.